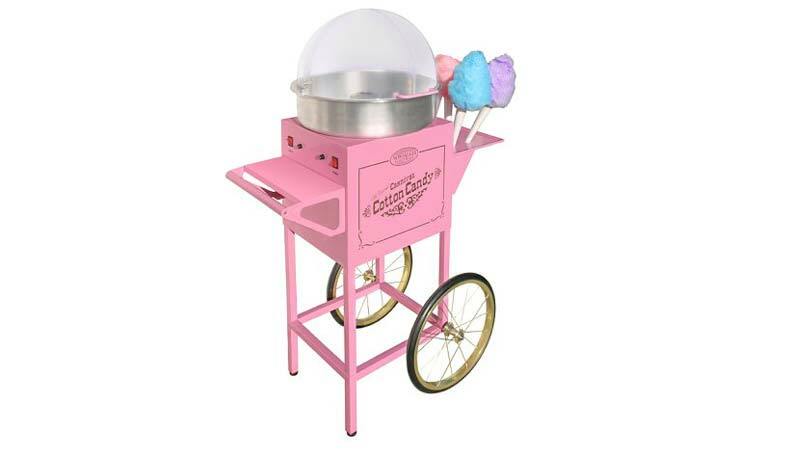 The Nostalgia Electrics CCM600 Vintage Collection Old Fashioned Cotton Candy Cart resembles an early 1900’s vending cart but includes the benefits of a modern day appliance. It stands 4 feet tall and is neat and compact. 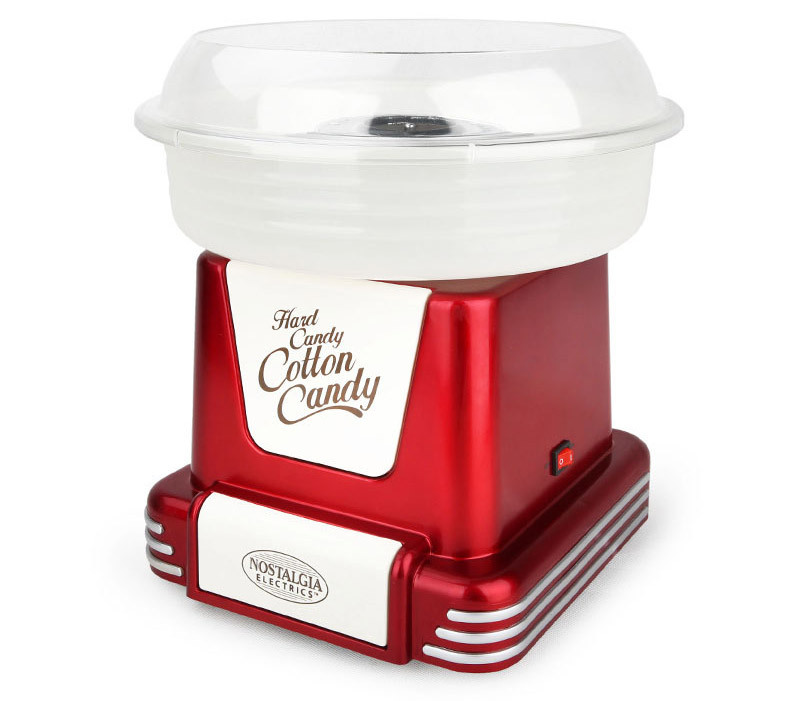 Once assembled, all you need to do is plug it in, turn it on, place either flossing sugar or hard candies into the center receptacle and you are ready to start creating your favorite carnival cotton candy. Cotton candy making and tasting is a fun activity for the whole family to enjoy. Young and old will undoubtedly enjoy the experience. You will soon have cones filled with perfect cotton candy and stick smiles and fingers all around. We absolutely recommend this pretty pink vintage machine. Stunning vintage look and decor addition to any carnival themed event. The Vintage Cart is fast and spins out cotton candy almost immediately. Easy to use and clean. The detachable bowl is coated with a non stick surface to ensure sugar washes away effortlessly. It includes 2 containers of pink vanilla floss and 2 containers of blue raspberry floss. Paper cones are also included so you can get started immediately. If you are using the machine indoors, you may notice a bit of sweet smelling cotton candy smoke so leave windows open to allow for ventilation. Most users report setup as relatively easy but a few have found it a bit challenging. Read the instructions through and it should take you about 25-30 minutes. Although this cotton candy cart is approved for commercial use, we feel it is more ideally suited for moderate use and smaller events like birthday parties and school fairs. If the wheels of your cart are a little wobbly, just add an extra washer and this should balance it out perfectly. The bowl is not deep enough to make huge carnival sized cotton candy balls but in our view, they are large enough to impress. As you make a few cones, sugar will collect in the bowl. This can easily be scooped up and reused.